The BlackBerry Enterprise Server is designed to be a secure, centralized link between an organization's wireless network, communications software, applications, and BlackBerry devices. 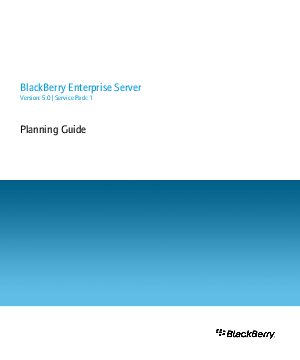 The BlackBerry Enterprise Server integrates with your organization's existing infrastructure, which can include messaging and collaboration software, calendar and contact information, wireless Internet and intranet access, and custom applications, to provide BlackBerry device users with mobile access to your organization's resources. The BlackBerry Enterprise Server supports AES and Triple DES encryption to protect and ensure the integrity of wireless data that is transmitted between the BlackBerry Enterprise Server components and BlackBerry devices. You can select from more than 450 IT policy rules that you can configure to control the features of the BlackBerry devices that are used in your organization's environment.